Artists and scientists both have the ability to offer a deeper understanding of our Ocean. They are important storytellers that help people to see the ocean in new perspectives. Applying these talents to ocean science and conservation can create a new space for dialogue and understanding. 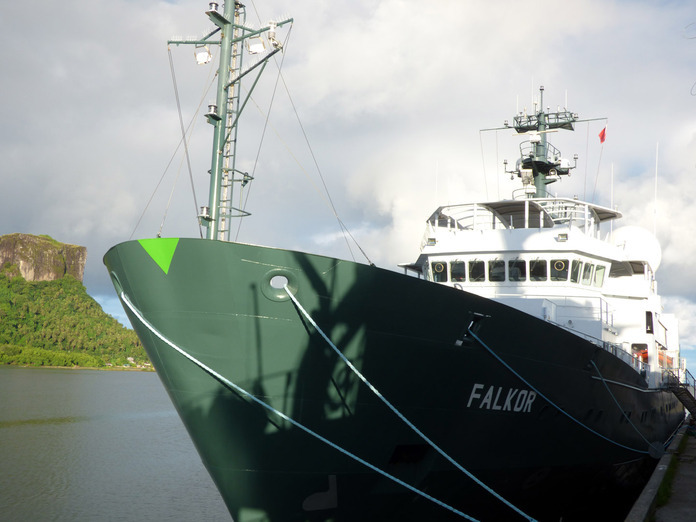 Schmidt Ocean Institute is uniquely positioned to provide collaborations between artists and some of the world’s leading marine scientists, using the Institute’s research vessel Falkor as a platform of connection and interdisciplinary reach. Our science cruises offer a range of unique technology-based ocean research that lends to artistic exploration. Like scientists, artists conceptualize and put together ideas in new ways. We anticipate that the cross fertilization of disciplines through our Artist-at-Sea program will result in a broader awareness of the important research occurring on Falkor and a better understanding of the complex ocean issues facing us today. We believe that by providing a platform where experts from different disciplines are brought together, cross-pollination of ideas will transform both the scientists’ and artists’ work. In January, a team of scientists will sail from Honolulu to Tahiti in search of low-oxygen areas of the ocean called oxygen deficient zones (ODZs). The cycling of carbon and nutrients – the foundation of marine life is fundamentally different in ODZs than in oxygen-rich areas. In recent years, researchers have become increasingly concerned that deoxygenation of the oceans from greenhouse gas emissions will greatly expand the total area of ODZs over the next 100 years. This first expedition of 2016 will study how these ODZ areas are functioning to better predict the oceans of the future. During this 28 day voyage, the artist will learn about the biogeochemical processes that occur within the ocean and translate their experiences with oxygen deficit zones into their work. Application forms will be provided online. Supplemental material must be submitted via email. Artists will be selected through a committee who will rank applicants based on: application of science, art dissemination, clarity and imagination, community service / outreach plan, desire and passion, experience and justification, online portfolio or digital examples of work, response to online application questions, and use of technology. We welcome art teachers and students who want to use and connect with the beautiful imagery, data, and science that is collected and shared by Falkor. All undersea dives using remotely operated vehicles are made available on Schmidt Ocean Institute’s YouTube channel. Scientific data collected aboard Falkor can be viewed on our Falkor Status page. Anyone wanting to use the data and visual imagery as part of their art content or installations are welcomed to the material. Please share your projects and ideas by contacting the Schmidt Ocean Institute Communications Manager at cwiener@schmidtocean.org.